The winner will be the holder of the Bardic Chair of Ynys Witrin for the following year, a title which will revoked after a year and day. The entry may be of any form, but the judges will consider relevance to the theme, adherence to the time limit and performance from memory as important in making their decision. The judges have the right to refrain from selecting a Chaired Bard if they feel none of the candidates are of sufficient quality or ability to fulfil the role. In this case the outgoing Chaired Bard will remain in office for another year and a day. The attention of the chosen and Chaired Bard will be drawn by the Council to ‘The role and responsibilities of the Chaired Bard of Ynys Witrin’ (hereto appended). Previous winners of the Bardic Chair of Ynys Witrin may re-enter after 3 years. The holder of the Chair is expected either to undertake to maintain the condition of the Chair, Ceremonial Robes, Silver Branch and Book, or to request the Secretary to make appropriate arrangements for their curation. The official artefacts must be returned to the Bardic Council at the next Annual Open Gorsedh. The Gorsedh retain the right to change these rules as necessary by committee meeting. Guidelines: The catchment area is defined as the distance that the Bard can reasonably be expected to walk into Glastonbury, perform their duties and return home again within the daylight hours. This is reckoned to be somewhere around 12 miles radius from the Tor. Contenders are expected to have been resident in the area for at least a year and a day. Points awarded from 1-5 for each quality and an additional point may be added or subtracted for ‘relevance’ and ‘audience’. There is a minimum number of points that the winner must get in all categories, in order to ‘be deemed to have met the standard,’ which is at least three points in each quality; the final tally is a guide to the judging process. The judges are also looking at Bardic relevance and understanding and the whole picture of the performance in context; in particular the judges should be looking to find a balance between the calibre of the performance and the quality of the words. It is also important that the incoming Bard is able to “bring something to the role”. Bards are primarily judged on their use of words, but other musical and performance skills may also be considered as relevant. Entries may be in the form of song, story and poetry up to 15 minutes long; contenders will be marked down for going over the time-limit. The Tim Sebastian Memorial prize for ‘the elevation of the word’. The Crown and Fool’s Cap were retired for the 2017 contest. New prizes will be introduced for additional competitions starting with The Silver Pen in 2018, which will be awarded for written entries on the theme. 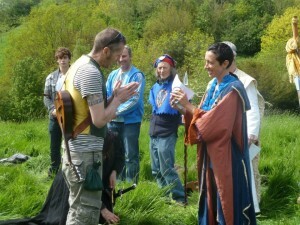 The primary responsibility of the holder of the Chaired Bard is to ensure the advancement of the Bardic Chair of Ynys Witrin by presiding over the organisation of the next year’s contest, attending Bardic Council and Gorsedh Committee meetings and handing over the title on St. Dunstan’s day of that following year. Beyond that the Bard may be called upon to perform in public. The area of jurisdiction is defined as being ‘Within walking distance of the Tor’. That is, the distance one can be reasonably expected to walk, perform one’s duties and walk back in a day. 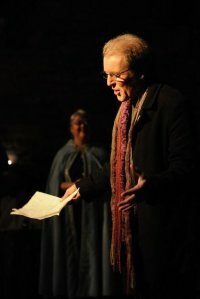 The tenure of each Chaired Bard is 1 year and 1 day; this means that on St Dunstan’s Day itself there are actually two Bards, the outgoing one and the new one. The post is largely an honorary one. The purpose of the award is to honour the best wordsmith in the community who chooses to compete for the Chair. It is up to the recipient of the prize to assist in the elevation of the word and promote the Chair in a manner appropriate to the position. The Chaired Bard may decide to include the following suggested roles among their duties. Where the incumbent is either unwilling or unable to fulfil any of these duties it defaults to the Gorsedh Committee to appoint a deputy drawn from the lineage of accepted Bards. A time limit may be applied in such cases. Use the title “Chaired Bard of Ynys Witrin” for all public performances they make during the year as well as use the title in their promotional materials. We hope that the Chaired Bard is able to act as a cultural ambassador for the town of Glastonbury and its surrounding area. The Trophy is to be awarded annually, as part of the Open Gorsedh in May, by the Gorsedh judges, who will interpret its purpose, ‘the elevation of the Word’, as they see fit. 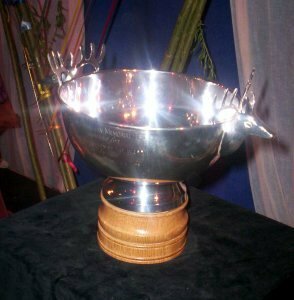 Eligibility for the award of the Trophy is the same as that for membership of the Gorsedh. Candidates for award are to be nominated. One nomination will be accepted from any one individual. Multiple nominations of the same person shall not be treated as votes. Nominations shall be invited at the Bardic Gathering in March. Nominations are to be sealed and passed to the Chair of the panel of Judges. The Secretary of the Council shall make such arrangements as are necessary to allow this. The deadline for nominations shall be set by the Judges, allowing themselves enough time to reach a decision before its announcement at the Finals of the Open Gorsedh. The holder of the Trophy is expected either to undertake to maintain its condition, or to request the Secretary to make appropriate arrangements for its curation. Prospective members of the college must demonstrate competence in skills of storytelling, music and/or poetry to the satisfaction of the Elder Bards. Performance at the Open Gorsedh will satisfy this requirement in most cases. Prospective members (‘Anruth’) must present themselves for initiation at the Open Gorsedh ceremony, whereupon they will become invested as full members according to their predilection (storytelling, poetry or music). 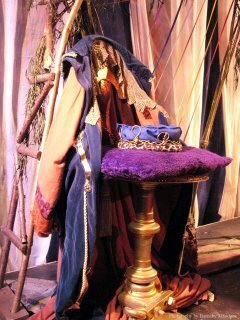 Previous holders of the Chair are known as Elder (or Grand) Bards. The Elder Bards are responsible for inducting new members into the College and keeping counsel with the initiated members. Such matters should be administrated separately from our public events with the Elder Bards being accountable to the Bardic Council as a whole. Honorary Bardships may be bestowed at the discretion of the Elder Bards usually to honour pre-existing merit and also in the case of a Bard being Chaired who has not taken formal initiation. These positions must be declared at an Open Gorsedh and it must always be made clear that these are honorary Bardships. We plan to accept members as Ovates on a similar basis; prospective members must demonstrate competence in their chosen discipline of seership to the satisfaction of the Elders.